Sensational, pure and different. Lois' Choice is one of our favourite varieties. This peony has beautiful, rose-like buds that bloom into beautiful, two-toned flowers. The flowers of Lois’ Choice peonies are full-petalled. 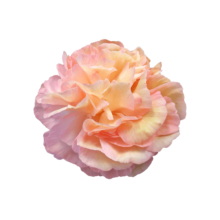 The incredibly delicate petals are peach and pink on the outer ring, turn peach and cream halfway through, and, eventually, turn back to peach and pink in the centre. This peony can turn a bit top-heavy, so it won’t stand completely upright by itself. The plants from this peony get easily damaged if the stems are cut larger than 40 cm. Those short stems can make Lois’ Choice a challenging peony to handle. But don’t let those short stems discourage you; you’d miss out on one of the best peonies available. This variety was bred in 1977 by Chris Laning and was registered in 1993. Lois’ Choice is a peony for peony lovers: one that has to be handled with all the love and care only a good peony grower can provide. If she’s handled with care then the plants will reward you handsomely, with its alluring flowers.